Never mind the game. The Devils lost in a shootout. They always lose shootouts. This was the home opener and it was Chico Resch night. Resch was an NHL goalie for 14 years with the Islanders, Devils and Flyers. 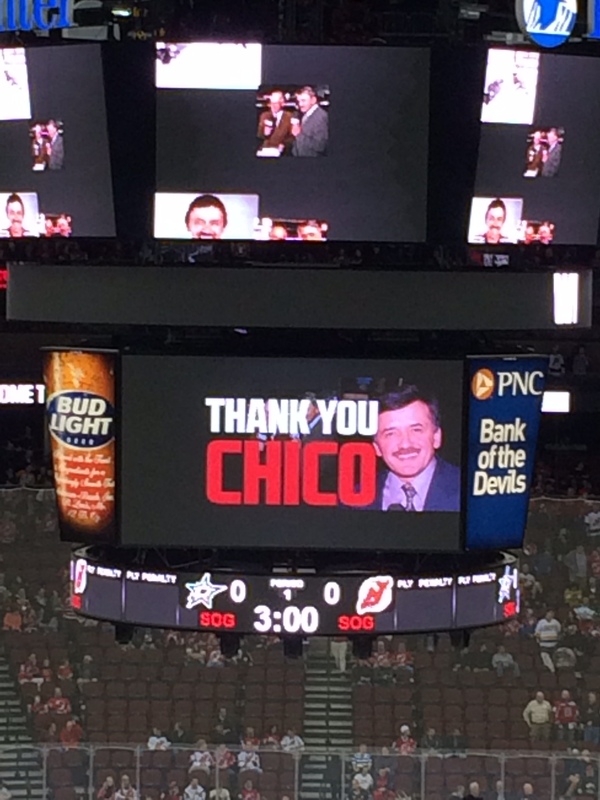 He was a Devils broadcaster for 18 years and retired at the end of the 2013-14 season. He is widely beloved by Devils fans, partly because of his work with the team but mostly because he is just a flat out nice guy. He’ll be missed. As for the Devils, things continued to go south from here. By New Year they were pretty much out of the playoff race. And since their best forwards were aged 42 and 39, “wait till next year” has a hollow ring. 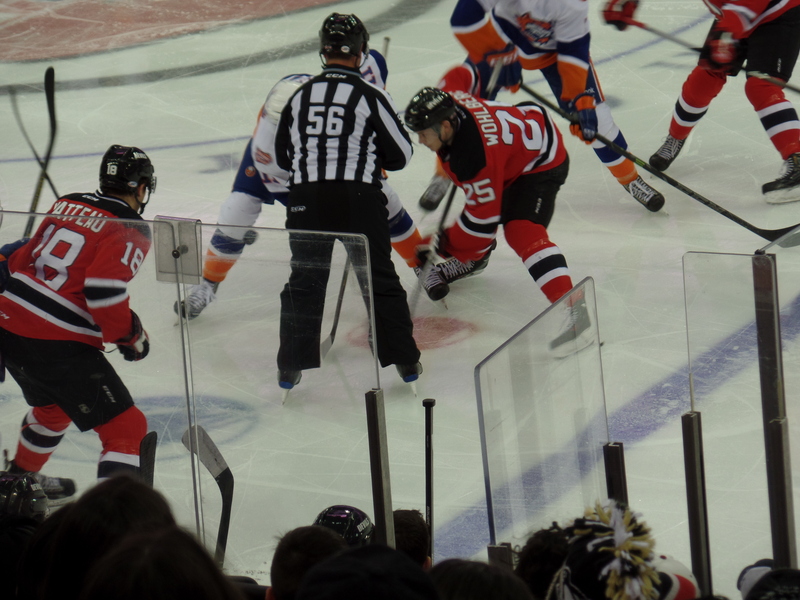 The American Hockey League affiliates of the New Jersey Devils and the New York Islanders got to take center stage at the Prudential Center in Newark. The A-Devils won a spirited, lively game. They scored 5 goals. At that point in the season the New Jersey Devils had reached that goal total 5 times in 47 games. This was a demonstration of what sports could be like without all the money. Tickets were $10 general admission. There was a spirited crowd that cheered and chanted. Some were families with two or three kids sitting in the lower deck, center ice. That could cost $1,000 for an NHL game. An Ontario Hockey League game at the Erie Insurance Arena. This was the best game I saw all year. the teams went end to end at full speed before an enthusiastic packed house. I don’t think either team dumped the puck all game. These guys can skate. The Erie team includes Connor McDavid, a guy who is being touted as a generation player. That is, a player the caliber of which only comes along once in a generation. 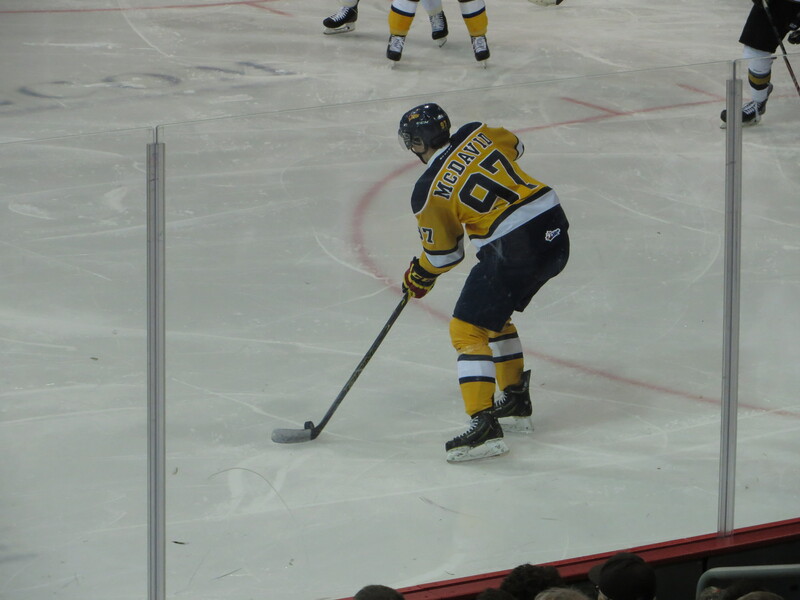 A Sidney Crosby or Mario Lemieus. On this frigid night in Erie, Pa., he did not disappoint. The Sabres are a woeful team. Coming into this game they had won twice in their previous 17 games. They were long since out of contention for everything except the sweepstakes that will result in drafting the aforementioned Connor McDavid. 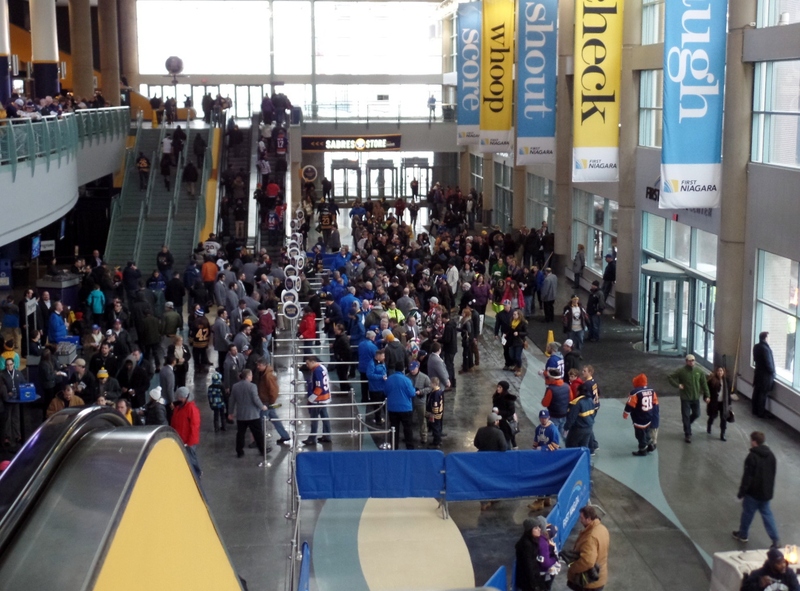 So that is why the picture is of the fans streaming into the First Niagara Center. Despite the terrible record and meaninglessness of this game, despite the fact that it had snowed all afternoon and was expected to continue to snow through the next day, the place was just about full. Buffalo fans surely deserve better. Not a marquee matchup in the world of college hockey. Coming into this game Princeton and Brown were last and next-to-last, respectively, in the ECAC Hockey Conference standings. As you can see from the score Princeton cemented its hold on the bottom of the table. But that is not the attraction here. 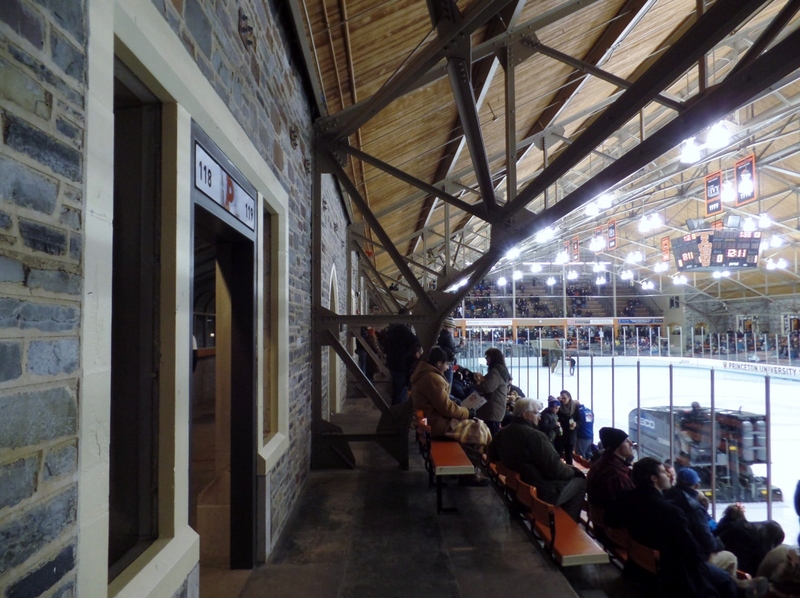 It is Baker Rink itself, a hockey venue that was built in 1922 and named after Hockey Hall of Famer Hobie Baker, one of Princeton’s most decorated athletes. With a capacity of 2,000, this is a great place to watch a hockey game, no matter who is playing. This was a New Jersey High School hockey Public A tournament round of 16 game. Southern went on to win one more game in the tournament before being eliminated in the semifinals. 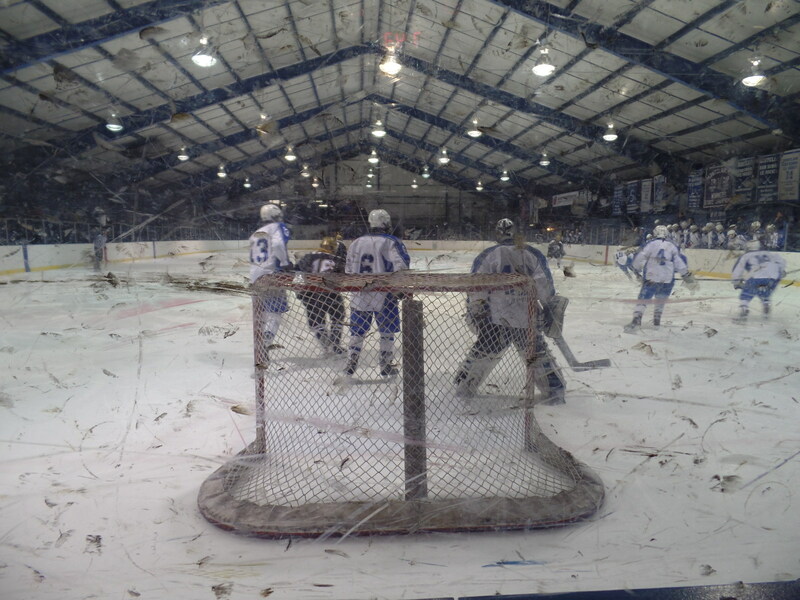 As you can see from this picture, Clary Anderson Arena in Montclair has seen its share of flying pucks. This was once the site of an outdoor hockey venue. Montclair High School would play night games here, something that was very popular with high school students even if a bit cold. And once in a while the spectators would include Montclair favorite son Yogi Berra. This entry was posted in Sports and tagged Albany Devils, areans, Baker Rink, Buffalo Sabres, Clary Anderson Arena, Erie Insurance Arena, Erie Otters, First Niagara Center, hockey, Montclair, New Jersey Devils, Princeton, Prudential Center, sports. Bookmark the permalink. I wish we still had a hockey team in Atlanta. It looks very fun to go to a game live. Unfortunately we will never get a pro team here again.